Visitors entering Algonquin from Park from the east on Hwy 60 can stop at the East Gate for information, permits and a washroom break. The East Gate is also the home the Peace and Reconciliation Totem Pole, carved by Algonquin Elder Dan Bowers and erected at the gate in 2015. 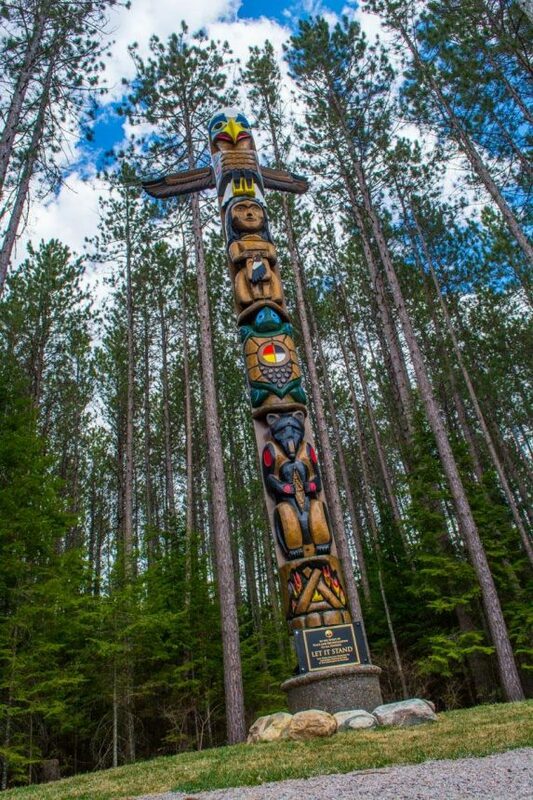 The information plaque states that the totem pole was “presented to Algonquin Provincial Park to share the culture of the Algonquins of Ontario, in the spirit of peace and reconciliation to all Nations”. The East Gate of Algonquin Park is at km 55.8 of Highway 60. The East Gate is 5.4 km west (on Highway 60) of Whitney, Ontario.